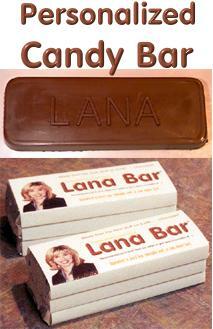 What woman wouldn't be impressed by receiving a candy bar molded with her name on it, wrapped in a custom wrapper? I like to give unusual presents, so I occasionally surprise my friends with something made just for them. Since women often crave chocolate as much as they crave to feel that they're truly appreciated for being a unique person, what present is more thoughtful than a gift of a custom candy bar? The hard part is making the mold, of course. To do that, I first machine a positive mold (i.e., a mold identical in size and shape to the finished candy bar). Then I use the positive mold to form a negative mold using a thermal vacuum-forming tool. The negative mold is formed using a flexible food-grade plastic, and this is the mold into which molten chocolate is poured. The mold is then placed in a sealed bag, and that is placed in a freezer to cool the chocolate. Once solidified, the chocolate bars are popped out of the mold and allowed to warm to room temperature. Following that, they're wrapped in a foil inner liner and the custom-printed outer wrapper. Here are higher resolution pictures of the front and back wrappers. Back in the days before bug zappers, crazy inventors (such as myself) who were tormented by mosquitoes crafted various gizmos to truncate the bloodsucking reign of terror imposed by those little critters. My solution was the Mosquito Motel. The original Motel, circa 1977, sported a well-lit interior (which attracted the skeeters) and a propeller spinning at over 10,000 r.p.m. at the entrance. A few mosquitoes made it inside, but most were cleaved into a mound of high-protein fertilizer. Surprisingly, all of the bugs who made it inside visibly intact were also visibly dead. I thought of a few hypotheses to explain this phenomenon, but—not being much of an entomologist—I never pursued the matter. The current version (pictured) also features interior illumination, but no spinning prop. How, then, can it wreak havoc with the arthropods? The door is hinged at the top, allowing a short tunnel (the interior of which is coated with a very sticky adhesive) to be placed in the doorway. The probability of an insect being able to fly in and out without being trapped is virtually nil. Hating mosquitoes as I do, such a demise lacks the satisfaction of the older model, but it sure is a lot quieter. I made this Motel for my Mom primarily as a decoration, but it makes a great indoor bug killer. A few bugs always seem to fly inside during the summer, and the Mosquito Motel obviates the need to manually exterminate them. The porch light serves to attract mosquitoes to the vicinity of the doorway, and adds an indisputable air of romance—important to the success of any motel. This picture does not do justice to the copper rooster weather vane and the fireplace (both of which turned out far better than I'd imagined), but such is the limitation of a low-bandwidth Web. 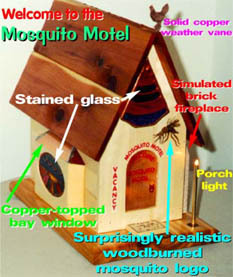 Since the debut of bug zappers, I assumed that the Mosquito Motel was an antiquated (albeit charming) device. However, scientists have recently discovered that zappers kill a lot of bugs but very few mosquitoes. Since some of the bugs killed eat mosquitoes, the net result is often an increase in the local population of skeeters. Not good. Another drawback to zappers is that they shower the surrounding air with a spray of bacteria, fungi, viruses, and assorted other yucky things from the zapped insects. If your picnic table is downwind of your zapper, you might be putting more on your hot dogs than just mustard. Not everyone likes staying in a motel. Apparently because they have nothing better to do, some insects prefer to spend their time mindlessly bouncing around the inside of lampshades. In view of their rather short life spans, this seems to be an egregious waste of time. If I had only a week to live, I certainly wouldn't spend it circumnavigating a 75 Watt light bulb. But to each his own. The Mosquito Motel is the knell of death for most insects, but some bugs make a beeline for the nearest lamp, wherein they are relatively immune to attack by humans who do not appreciate the noise of the vermin pinging around the lampshade. After putting up with this perennial summer annoyance for years, I decided to unleash a weapon of mass destruction (well, for insects, anyway): the Insect Inn. The Insect Inn is decidedly less charming than the Mosquito Motel, but it gets the job done—and it sure is a lot easier to make. As you can probably see (barely) from the red arrow on the diagram, the Insect Inn is placed inside a lampshade so that the openings of its chambers are oriented to the primary insect flight path (around and around). Once inside, bugs are trapped by a sticky adhesive and the innkeeper—that's me—can get to sleep. Another version of the Insect Inn (not pictured) was suitably colored in green camouflage for trapping crawling insects with an affinity for potted plants. At first glimpse, this looks like a Christmas gift from the Unabomber. Upon closer inspection, it's yet another bug killer . . . surprised? The yellow cord projecting from the top of the Wacker (yes, I know the correct spelling is whacker—please allow me the creative license to whimsically butcher the English language) allows it to be hung wherever wasps are likely to congregate, such as under eaves. Suitable attractants (such as fish-flavored cat food) placed in the Wacker via any one of its several small holes lure wasps inside, whereupon they're introduced to the adhesive properties of fly paper. 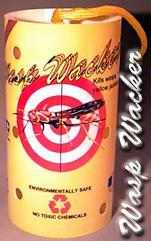 As you might expect, the Wasp Wacker also kills flies, yellow jackets, hornets, and assorted other pests. If you use a commercially available insect repellent (almost all of which contain DEET as their active ingredient), you should know that you don't have to apply it to your skin or clothing for it to be effective. Bugs are repelled by the smell of DEET, not because you're covered with the stuff. Anything which disperses DEET vapor into the air around you will have the same effect. I invented this device to disperse DEET without the need for it to be applied to skin or clothing. DEET (short for N,N-diethyltoluamide) can be absorbed through the skin and cause irritability, headaches, insomnia, confusion, and seizures, especially in children. 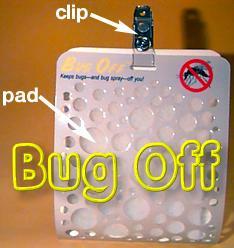 In use, insect repellent is applied to the pad, which is then placed inside the Bug Off case. A handy clip allows the Bug Off to be attached to clothing, and its to and fro motion whenever the wearer moves serves to increase dispersion of the repellent. Clever, eh? It is difficult to appreciate from this picture, but the Wasp & Fly Trap is considerably larger than the Wasp Wacker. 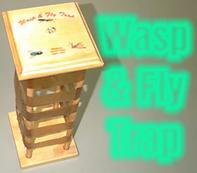 To use this gizmo, a suitable attractant is placed inside the device and five bands of fly paper are strung horizontally around the four corner posts. Since insects seem to have a tough time flying in a straight line (and they don't know until it's too late that the fly paper is the last thing they'll touch), there is a good chance that a bug won't make it in and out of this trap without becoming a permanent wallpaper decoration. Aren't I cruel? If you have any lingering doubts about my sanity, you won't after reading this section. When I was in my first year of medical school I lived in the basement of my girlfriend's parent's home. At that point in my life I found it very difficult to study unless it was absolutely quiet, so I did what any eccentric inventor would do: I built a sound-proof booth. With a double wall of acoustical board it was incredibly quiet—and airtight. Cognizant of the risk of suffocation, I included a ventilation fan and air intake and exhaust ducts. To prevent sound from entering the ducts, they were shaped like a labyrinth. After breaking up with that girlfriend I departed from their home in a rather hasty manner, which prevented me from taking along my 300-pound booth. In retrospect, I wonder why I went to the trouble of making that gizmo when a pair of earplugs would have sufficed. 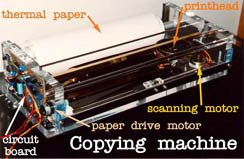 Given the prevalence and low cost of copying machines, you may be wondering why I actually made a copying machine. Let me assure you, after a month of machining plastic, brass, and aluminum to 0.0005" accuracy, I was wondering the same thing myself. The original goal was to make a very low cost copier which would be small enough (about 3" square by 9" long) to fit in a college student's backpack. The prototype was larger than this, of course, but it could have been easily reduced in size for a production version. Yes, the contraption worked, but don't sell your stock in Canon or Xerox just yet. Shortly after completing the prototype, another company marketed a copier which was almost identical to the one I'd conceived. The early bird catches the worm . . . . The programming was stored on a magnetic tape simply because I had more knowledge at that time of how to encode data on a tape than to store it in a RAM (or other memory) chip. The mower itself was a discarded Wards 22-inch mower that barely ran. I overhauled the engine and performed a valve job on it, after which it ran better than new. I painted the mower deck yellow (being a Ski-doo fan), and I painted most of the gizmos that I added either wrinkle-finish red or wrinkle-finish black (because I have no conception of how to harmonize colors). After the paint was dry I assembled it and tested it on my Mom's front lawn, giving motorists passing by a glimpse of the future of lawn mowing. Did it work? Yup, far better than I ever imagined. So what did I do with it? Nothing. Although I built all kinds of safeguards into the system (sensors to detect dog chains, beer bottles, and errant babies, for example), I was certain that some idiot would eventually find a way of mowing over his neighbor's poodle or children, after which I'd be prey for a "personal injury" lawyer and jury who believe that consumers cannot be expected to exercise a bit of common sense. I disassembled the mower to provide parts for gizmos yet unborn, and I went back to medical school. UPDATE: Three decades after I made mine, commercially available lawn mowers are still pathetically underpowered and dumb: they wander about, mowing in a random pattern. That is utterly unnecessary, wastes energy, prematurely wears out the device, limits the size of yards they can feasibly mow, and is a safety hazard—all because the engineers who design these things haven't figured out what I did 30 years ago. Back in the days before Caller ID, I'd sometimes wonder if anyone called when I was not at home. My answering machine would indicate how many messages I'd received, but not how many people called without leaving a message. Generally, such a fact is a useless bit of trivia, but there are times when it is helpful to know. As they say, inquiring minds want to know . . . In retrospect, even if Caller ID hadn't nixed the marketability of this device, I think its sales potential would have been limited. 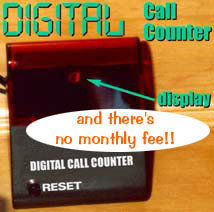 I still use the device, though, because Caller ID is not yet available in my neck of the woods. I made this device to automatically mute the sound from my television or stereo system if the doorbell rang, or if I received (or placed) a phone call. The sound would automatically resume after the call ended. There are all sorts of ways to do this, and most of them are better than the way I chose, which was to use relays to open the circuits leading to the speakers. It worked fine, but in retrospect there was a much easier way: have inputs from the phone line and doorbell trigger a programmable infrared remote control. This could not only mute the sound, but also stop the VCR, CD player, tape player, etc. I used to work the night shift in the ER, which necessitated sleeping during the day. Although it broke my heart to miss all those important offers from telemarketers, I'd turn my phone off before going to bed so my sleep would not be interrupted. Just one problem: Amy, who was my girlfriend at the time, wanted a way to reach me in case of an emergency during the day. I can't recall exactly why she wanted to do that (we weren't married, had no kids, and she didn't even seem very fond of me), but I was so enamored with Amy that when she said jump, I'd ask "How high?" Hence, I whipped out my soldering iron and went to work. The Amy Alert had two main parts: a device that differentiated calls from her, which then sent a coded radio signal to a receiver under my bed. The radio signal was decoded, triggering a loud alarm. I spent many hours making this system, and to the best of my recollection, it was never used except for a test run. I made this wall decoration by routing the edges of a piece of cedar, and milling out the back to accept the LEDs (Light Emitting Diodes), wires, battery, and other electronics. The tree pattern was embossed with a woodburner. When the present (see that shiny red and gold box with green ribbon?) 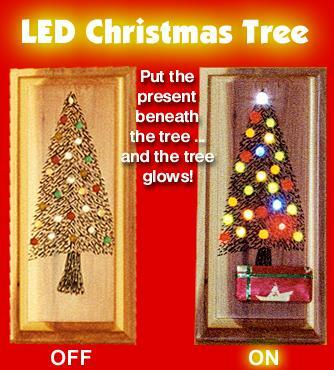 is placed under the tree, it lights up. My camera didn't capture the beautiful luminosity of the LEDs, but the "ON" picture will give you some idea (a poor one!) of its illuminated appearance. I used mostly red, green, yellow, and amber LEDs, but also two blue LEDs and one white LED. Unless you're into electronics, you may not know that blue and white LEDs have been sold for the past few years, and as their prices drop they're sure to be used in more devices. The blue LEDs emit a much more vivid blue than what this image suggests, which leads me to conclude that the dynamic range of vision is greater than the dynamic range of the color spectrum that can be captured on film. I also tried using my digital camera, but the results were far worse (its sensor was easily saturated by the glow of the LEDs). Although holding a book while sitting on a lawn chair cannot be construed as a particularly taxing activity, I've noticed that doing so over a prolonged period can result in forearm fatigue. (OK, call me a wimp!) My solution to this vexation? The Lazy Hours® Book Holder. Not shown, but certainly a useful accessory in this period of global warming, is the FanTastic® Lawn Chair Fan. Powered by a rechargeable battery, its 5" propeller kicks out more air than some window fans. (I kid you not!) In contrast, the Black & Decker® Snake Fan™ is an absolute joke, notwithstanding its computer-designed fan blades and stators. Actually, I've made a number of different FanTastic® fans. The original model was designed with a semi-rigid gooseneck stem which draped around my neck, positioning the fan somewhat precariously about 10" in front of my lower face . . . without a fan guard. Its coiled power cord led to a control box, which housed a pulse-width modulator I made to control the fan speed (as every electronics gizmologist knows, reducing motor speed with a rheostat or resistor wastes power). The unit was powered by a dozen ni-cad "D"-cell batteries, which were strapped to the same belt which held the control box. Positioned on the back of my waist, this gave me the appearance of an astronaut, or an escapee from a mental institution (especially the time the battery pack developed a short, melting the plastic battery holders on my back!). an automobile version, which mounted on the steering column of my old Pontiac (this was before I could afford a car with air conditioning, needless to say). an AC-powered wall-mounted unit, which I used in some hospitals whose apparent means of sterilization was to heat the air to a point that was incompatible with life of any sort. a tiny pocket version housed in a penlight case, topped by a 1.75" propeller. Its motor was extracted from a micro-cassette recorder, and was unbelievably efficient and powerful. I used this in overheated hospitals (see above), especially while doing surgery, entertaining pediatric patients, and impressing cute nurses! a version which clips on the handlebar of my lawn mower, to keep me cool while mowing. I no longer have the courage—uh, am stupid enough—to wear the one around my neck! Imagine that you're a television reporter working outside in wintertime, with the temperature plummeting to 20 degrees below zero. Imagine that you're trying to speak on-camera without your teeth chattering. Imagine that one of your friends is an inventor with a lot of free time on his hands. His solution? The Chill Chaser, of course! Years ago, I read an article in Outdoor Life magazine—or some similar repository of great medical knowledge—which said that there are thermoreceptors (nerves which sense temperature) around the kidney area. When this area is kept warm, you feel warm, comfy, and cozy—even if you have frostbitten fingers and toes falling off!! I found it a bit difficult to believe that it is so easy to trick the body, so I put this idea to the test. I sat outside until I was shivering constantly, then I positioned a handwarmer (kidneywarmer?) around each kidney area. Within minutes, I felt as if I were sitting on a warm tropical beach, my body bathed in luscious radiant heat . . . a-a-a-a-a-h-h-h-h-h-h . . .! Given that this technique suppresses the shivering reflex (which is your body's last defense against solidification into an ice cube! ), this approach is not without risk. I certainly wouldn't recommend it for prolonged use, but for short-term use, it's ideal. I made the EPC to remove tarnish from brass colored electrical plugs, which invariably develop an oxidation or tarnish layer over time (the silver colored plugs rarely become tarnished). You'll notice this oxidation as a dulling of the normally shiny brass blades on the plug. This tarnish layer imparts resistance to the flow of electricity and thus wastes energy because the current from an electrical outlet must pass through this layer before it can enter the conductor of the plug and eventually reach the appliance that is being powered (energy is dissipated [i.e., wasted] whenever electricity passes through resistance). Using the EPC is easy. Remove the plug from its receptacle and insert the blades into the slots of the EPC. Squeeze the sides of the plug cleaner to apply pressure onto the blades while pulling the plug out of the EPC. Repeat this a few times until the blades are shiny. To clean a 220 V plug or to clean the ground of a 3 conductor plug, simply rub one of the edges or surfaces of the EPC against the blades of the plug. Alternatively, for 220 V plugs, you may insert the blades one at a time into the EPC slots. Blow off any dust that may have accumulated on the plug during cleaning, and reinsert it into its receptacle. 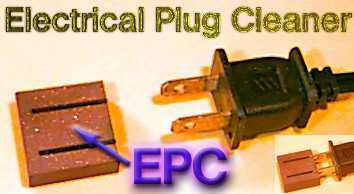 My original prototype for the EPC was molded from plastic and had abrasive inserts to clean the plugs. It looked neat, but as soon as I made it (wasting a week just to make the mold! ), I thought of a much easier way of making an EPC out of rubberized abrasive. As an added bonus, this new version was far more durable (it'd probably last a lifetime for an average user). How much energy can you save by cleaning your plugs? The new plugs I tested didn't have much oxidation; they wasted about 2 to 5% of the energy drawn by the appliance. The most tarnished plug I tested wasted about 25% of the energy. Even if the average savings is only 5%, a person would save thousands of dollars during his lifetime—not bad for a $5 gizmo, eh? While the energy saved by using an EPC may not seem to be very significant, a 5% savings in energy consumption could go a long way toward easing the energy crunch in California and other areas with borderline energy supplies. Incidentally, the cost to make an EPC is far less than a dollar. If the governor of California were a smart man he'd give an EPC to every household and business in his state. That would make him into a hero and restore his political future, which has been tarnished (pun intended) by the energy fiasco. Another advantage to using the EPC is that it can extend the life of certain motorized appliances (specifically, those that have motors which can be damaged by a low supply voltage [a.k.a. brownout], such as a refrigerator). Whenever current passes through a resistance, a voltage drop develops. Hence, a tarnished plug will lower the voltage supplied to the appliance and make it susceptible to damage in borderline brownout conditions. Bizarre twist to the EPC story: read this excerpt from one of my books. This tool allows a hole to be threaded from the inside out—which you'll probably think is a seemingly impossible task if you're familiar with tapping (threading) tools. For most of my life I was perfectly content to thread holes in the standard manner: from the outside in. Then tragedy struck. While changing the spark plugs in my car years ago, I inadvertently cross-threaded the hole. Cross-threading occurs when the spark plug enters the spark plug hole at an angle. This mangles the existing threads, pushing them out of alignment with the deeper, intact threads. Since the cross-threaded threads no longer point the spark plug down the correct axis of the hole, the spark plug cannot be fully seated. Even if the spark plug is withdrawn and reinserted, it now engages on the cross-threaded threads—still the same problem. Most mechanics are familiar with cross-threading because it is easy to do, especially when the spark plug hole is in an awkward spot and when the cylinder head is made of soft aluminum. At the time I cross-threaded my hole I consulted several mechanics, all of whom told me the only solution was to drill out the hole, thread it, and insert a Heli-Coil (a small cylinder of metal that's threaded on its inside and outside; once the Heli-Coil is inserted the spark plug can be reinserted). The drawback to this remedy is that I'd either get metal shavings inside my engine (from the drilling and tapping) or I'd have to pay hundreds of dollars to have my cylinder head removed prior to the Heli-Coil insertion. Neither outcome appealed to me, so I made the reverse rethreading tool (RRT). In use, the pin (near the far right in the picture) is removed and half of the RRT is inserted into the cylinder beyond the innermost spark plug threads. Then the other half of the tool is inserted. The pin is replaced, aligning the tapping threads. The threads are then engaged on the innermost threads of the spark plug hole and the tool is screwed from the inside out. When the RRT encounters the cross-threaded threads, it restores them to their original alignment, allowing the spark plug to be correctly inserted. I made a fancier version of the RRT that was easier to use and incorporated an adapter on its outside end that allowed it to be used with a standard socket wrench, but the original version (pictured) worked like a charm on its first try. I thought that mechanics would like the RRT so I contacted a tool manufacturing company, but they said they weren't interested because the market for such a tool wasn't large enough. Fifteen years later another company introduced a similar tool, so I think the gloomy "the market isn't big enough" assessment was wrong. Back in the 1970s I thought of a way to make an airplane transparent to radar and I contributed this idea to the government's Stealth aircraft project. However, they didn't use my technique, which enabled solid objects to be literally transparent to radar. Instead, they use a system that achieves effective transparency by altering radar reflections and by using an airplane "skin" that absorbs radar energy. I hadn't given much thought to radar transparency over the past few decades, but recently I was watching a tasty food cook in the microwave oven when I realized that one of the chemicals in this food acted like a magnet for sucking up microwave energy. (Yes, I know that any food containing water absorbs microwave energy—that's Intro to Microwaves 101 stuff. The food that I discovered is a much better microwave "sponge.") But what is the practical use of this new invention? To paint cars so that they're immune to police radar? To coat drug-running aircraft so they can slip by the U.S. perimeter radar array? To use as a hair spray so that a person can use a cell phone without the long-term risk of brain cancer or the short-term risk of interference with memory and other higher brain functions? A device called the zBox is now being marketed so that people who use it can receive UPS or similar shipments when they are not at home. That's a good idea because having your merchandise in a locked box is certainly more secure than having it sitting on your porch. That's the good news. The bad news is that they're charging $5 per month. That's $60 per year or $600 per decade. Want more bad news? That $5 monthly charge is what they term their "introductory rate." Translated, that means they're going to eventually charge more. Years ago I thought of a simple locking mechanism that I termed the Uni-Lock which could secure a mailbox or larger box to receive UPS shipments. The delivery person could open the box as freely as if no lock were attached, but it locked as soon as the container was closed. It cost less than a dollar to make, and there was obviously no monthly charge. Another advantage over the zBox is that the Uni-Lock did not require a digital code to open it. How many mail carriers are going to bother punching in your secret digital code? Probably zero. And what do you do if the zBox battery dies or its electronic lock is zapped? Cut it open with a chain saw? Ever see homemade shock absorbers before? Probably not. Just about everyone who needs a shock absorber buys one. However, I needed one with some unique characteristics so I made my own. Incidentally, those gleaming polished tubes that form the shock absorber bodies were once pitted, rusty hunks of metal sitting in my garage. Isn't it amazing that a metal lathe can produce such a transformation? 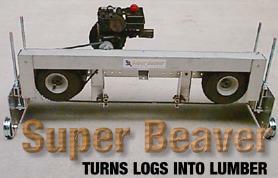 This is a bandsaw I made powered by a gasoline engine that cuts logs into lumber. Given that lumber is readily available, you're probably wondering why anyone would take the time to make a device that makes lumber. First, if you're a wood connoisseur, you probably know that first-rate wood never makes it into lumberyards; instead, it is turned into veneers. Consequently, if you want a first-rate piece of wood with strikingly beautiful grain, you're not going to find it at Home Depot or your local lumberyard. Second, when you cut your own wood you can produce sizes that aren't commercially available. Let's say you want some solid maple 8" x 8" beams. Even if you could find them, you'd probably have to raid your children's college fund to pay for them. If you cut your own, they cost next to nothing. Third, cutting your own lumber allows you to decide how to section the log. I won't go into a long treatise on lumber sectioning, but suffice it to say that there are several different ways of cutting up logs to maximize grain patterns, strength, resistance to warping, and also to make the most efficient use of the log. When you're doing the cutting, you can select just what you want. Fourth, depending on the variety of trees on your land, you often have wood species that aren't commonly stocked in lumberyards. For example, on my land I have oak, maple, and several species of evergreens — all common enough. However, I also have ash, basswood, poplar, quaking aspen, and other uncommon species. Fifth, you can save a lot of money by cutting your own wood. It may be a waste of your time to cut structural lumber (e.g., 2 x 4's for wall framing), but if you consider the exorbitant cost of hardwoods such as maple, the savings can make lumber harvesting a worthwhile endeavor. Sixth, by cutting your own wood you can make use of trees that would otherwise go to waste. When I was a teenager we lived on a road frequented by very noisy gravel trucks. When they'd get within a few hundred yards of my house they'd obscure the sound from a television or radio. To avoid missing 20 seconds of the broadcast I'd either have to get very close to the speaker or turn up the volume, then turn it back down once the gravel truck passed by. I became sick of doing that after a few thousand times, so I made a device that sensed the outside noise and automatically adjusted the sound accordingly. When a truck (or lawnmower, or whatever) approached, the volume would increase. As it came closer, the sound would ramp up even more. As the noise source retreated, the TV or radio sound output would fall. A few years after I made my gizmo, one of the luxury car manufacturers incorporated this feature in their cars. However, it seems to me that most modern cars are sufficiently well-insulated from outside noise that this feature isn't necessary. I like to use fresh cranberries in baking, but I dread sorting through them beforehand to sort out the ones that are too bruised or just plain rotten. To ease this arduous task, I invented a machine that sorts the cranberries according to freshness. Just dump the cranberries in: the fresh cranberries drop into one container, and the yucky ones drop into another container. Presto! With slight modifications, the cranberry freshness tester could sort other small berries, too. I used to wonder why a significant proportion of the fresh cranberries I buy are bruised, while far fewer blueberries (or other similarly fragile fruit) are damaged. After watching the evening news last week, I no longer wonder why. They showed cranberry farmers dumping tons of cranberries into deep piles, into which the farmers were shown walking using waders. My first thought was, "Why on Earth are they walking in the cranberries?" My second thought was a realization that they likely do not sterilize those waders beforehand. Yucch. For electricity to flow in a circuit, you need a voltage source (such as a battery or generator), a wire to connect it to a load (such as a light bulb or motor), and a wire that returns the electrons to the voltage source. 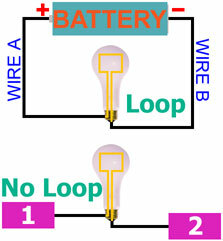 The top image in the adjacent diagram schematically depicts a traditional circuit. Electrons leave the negative (-) terminal of the battery, flow through WIRE B, enter the base of the light bulb, flow through the filament (colored yellow), then leave the bulb and flow through WIRE A back to the positive (+) battery terminal. The key is what's in boxes 1 and 2. I'm not saying, on the off chance that there is some useful application for this technique. Most likely, this is just a gee-whiz lab curiosity, and not something that is very practical. The one obvious application (using it to eliminate the expense of the return wire (Wire A) isn't practical because wire is generally cheaper than the contents of the purple boxes. The only time this would not be true is when a fairly small current was transmitted a long distance (call it "x"); that requires 2x of wire. My way requires a wire length of only x. If you would like to see more of my gizmos, check back in the near future. I have hundreds more to add, which I'll do as time allows.